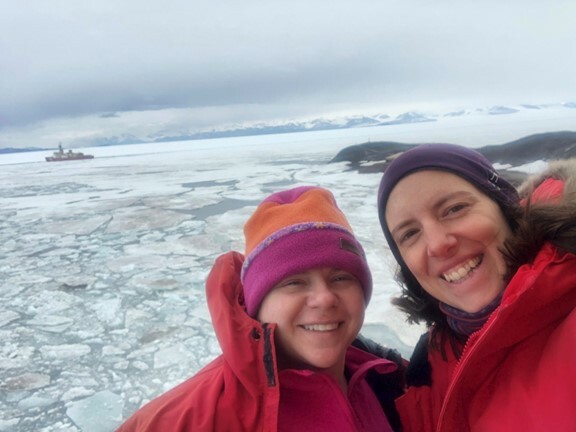 Barb (left) and Juliane (right) on the Nathaniel B. Palmer Science Vessel. In the background you can see the ice breaker “Polar Star”. ANSMET container (mil-van) filled with gear, river-boxes, and wooden tent boxes, all ready to go for the next ANSMET season. 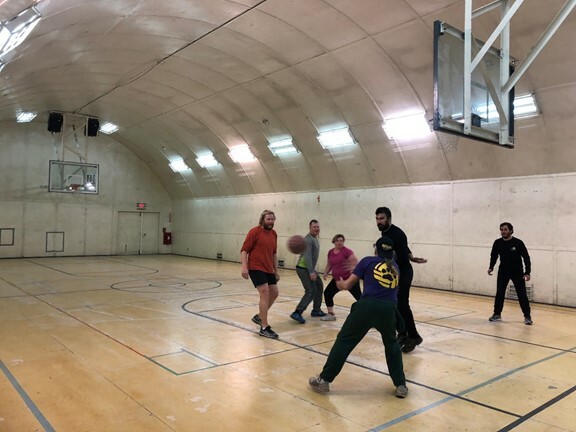 Fun time ANSMET basketball play inside the McMurdo gym. From left to right: James, Jim, Barbara, John, Ioannis, and Scott. Ioannis was the super star and we all had a really, really good (and sweaty) time. Another two days have passed here in McTown with lots of work, some fun, and magical nature. The weather has been tropical -2C and we feel really warm, way too warm. We got Sunday off and so some of our team members went on the big Castle Rock Loop hike, while the rest of us enjoyed the super awesome Sunday brunch at McTown with French Toast, lots of cheese, pickles, crackers, pastries, and canned fruit. The ice breaker “Polar Star” has left and the science vessel “Nathaniel B. Palmer” has docked in its stead. And since we had the day off we decided to tour it. We were mightily impressed with the ship, it is a Disney Cruise for scientists. It is 308 feet long, 60 feet wide, and was built in 1992. Compared to the Polar Star with its small, labyrinth-like hallways, the science vessel is spacious. It has wide hallways, really nice big lab spaces, and large 2 persons sleeping cabins that all have their own bathrooms (we only have communal bathrooms here, but hey, at least they are indoors as compared to the deep field, so we are still thrilled about our communal bathrooms here!). There was even a self-made clean room where scientists study how phytoplankton reacts with trace metals. Really impressive! We also go to see the bridge and even got to climb up to the “ice tower” where they watch for ice bergs and thick ice sheets. And while outside on the aft of the ship, we had the privilege to see an Adeline penguin walking on the ice sheet in front of McMurdo, flapping its little wings, and diving in picture perfect form into the water. SO CUTE!! Nature here is incredibly beautiful in its simplicity, and yet complexity. Today started out with snow, lots of thick, flaky snow. I was super excited about it, I love snow in case you haven’t noticed yet. The rest of McMurdo wan’t as excited as I was. All incoming (and thus outgoing) flights were canceled. This is the second day in a row and things are starting to back-up, but we are not worried yet, Feb. 1st is still some time away and we are sure things will be sorted out by then. We started the day with our usual science meeting. 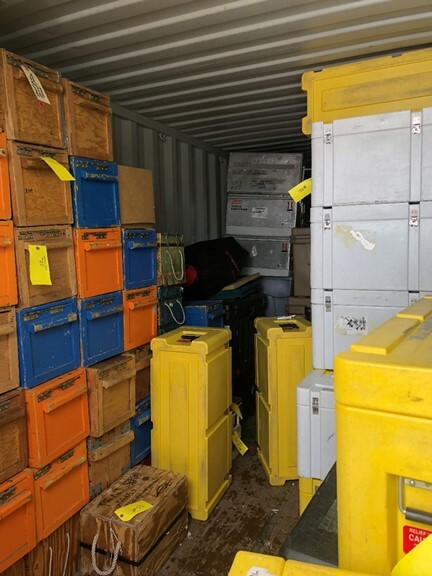 More of our cargo has arrived and we spent the morning and afternoon cleaning gear, river-boxes, and stoves, we returned some of it to the BFC (Berg-Field Center) and loaded the ANSMET container up with ANSMET owned gear to get it ready for next year’s field season. Now we only are missing a few things, including 4 of or skidoos. We also had some fun time today: Scott and I went for a little run down to Hut Point and were accompanied by two minke whales that used the channel cut by the ice breaker as feeding grounds. Later in the evening we all finally gave into Ioannis’ cajoling to playing basketball with him. If we had only known how darn good he is….he creamed us all!! But we didn’t know, so we decided to go for it. Even John played and we had a solid hour of intense ball play with lots and lots of fun. Now we are all exhausted and ready for bed. We are not sure what tomorrow will bring but whatever it is we will handle it with enthusiasm and joy. Good night y’all and sweet dreams. Juliane, McMurdo Station, Antarctica, Jan. 22nd at 11:30pm.